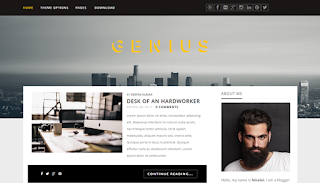 Genius is a beautiful, responsive, and easy-to-use blogger template built with Love. It’s a perfect fit for bloggers, photographers, and artists who need an effortless way to showcase thire work. Genius is an Responsive blogger template, with many premium features, the theme is highly optimized for both mobile and desktop platforms.